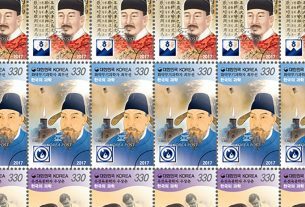 (News from 우정사업본부 / KoreaPost) On 12 October 2018 KoreaPost released a stamp commemorating the 150th anniversary of General Hong Bum Do’s birth. 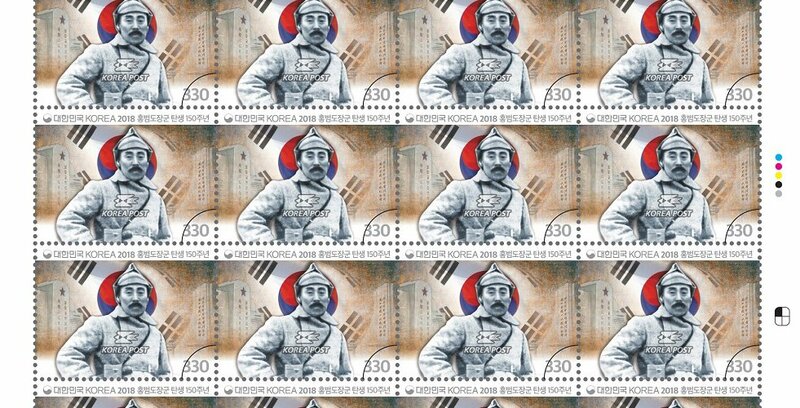 Hong Beom-do (August 27, 1868 – October 25, 1943), was a Korean independence activist born in Chasong, North Pyongan. 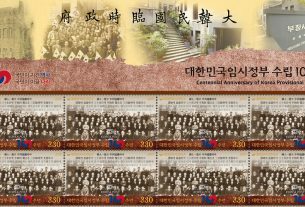 Hong organized a resistance force named the Righteous Army during the Japanese occupation of Korea. 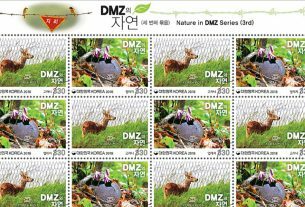 No further information was released by KoreaPost at the time of creating this news release. General Hong Beom-do (1868 – 1943) is a legendary leader of the Korean Righteous Army and the Korean Independence Army, who began his fight against the Imperial Japanese Army; continued engaging in armed conflict for Korea s independence for more than 50 years, until his last breath in Kazakhstan. Born into a poor farming household in Pyeongyang, General Hong lost his parents when he was young and had to endure an arduous childhood life, working as a servant. During his midteens, he lied about his age to enlist in the military. However, he ended up going absent without leave due to the unbearable level of corruption internally. He then gained recognition as a hunter thanks to his superior skill in rifle shooting and continued to enjoy a stable life until joining ranks with the Korean Righteous Army. In 1907, Japan passed the Control of firearms and Explosives Act that required hunters to turn in their hunting guns. In response to the outlawing of his personal hunting arms, General Hong organized resistance forces, leading them to substantial victories against Japanese garrisons. In 1910, after earning the nickname, Flying Hong Beom-do, for his stellar performance as the leader of the Korean Righteous Army, he crossed the border into Manchuria with a small number of followers while continuing the fight against the Japanese army and training soldiers for the Korean Independence Army. 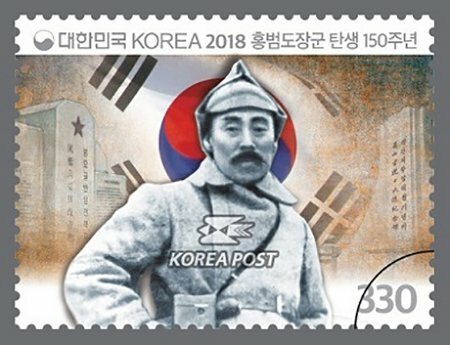 In 1919, immediately upon the rise of the March First Movement, he returned as a commander-in-chief in the Korean Independence Army and successfully attacked Japanese troops. Most notably, he defeated the Japanese Imperial Army in 1920 as the top commander of the Korean Independence Army in the Battles of Fengwudong and Qingshanli, both regarded as the greatest victories of the Korean Independence Army against the Imperial Japanese forces. In preparation for Japan’s massive retaliation, he moved to the area bordering the Heilongjiang Province of China, along with other independence fighters and formed the Korean Liberation Army, serving as its deputy commander. In the wake of the massacre at Alexeyevsk (present-day Svobodny), the most tragic incident in the history of the Korean independence movement, General Hong had to do away with his plan to resume the armed resistance against the Japanese army in Russian territory. He then ran a collective farm in Primorsky Krai and strove to inspire the national spirit among Korean expatriates living in the Russian territory. In 1937, however, Stalin`s expulsion of Koreans from the Russian Far East drove General Hong to Kazakhstan, where he served as a senior leader in the Korean community before passing away at the age of 75 in 1943. General Hong Beom-do was the most revered resistance figure. 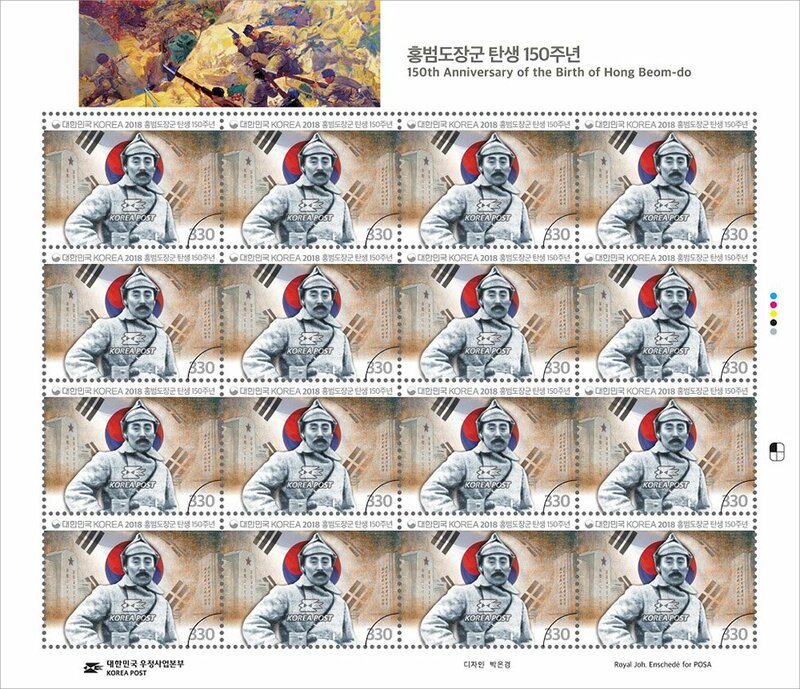 We hope this commemorative stamp will serve as a reminder to all Koreans, at home and abroad, of his lifetime devotion to the armed struggle for national independence during the Japanese Occupation, from his time as a leader of the Korean Righteous Army to his dedicated service as commander of the Korean Independence Army.